After deciding which convention you’d like to go to, then it’s time to prepare. The first step is to book tickets, flight and hotel. While this might seem obvious, if you wait too long then the convention might sell out or the nearest hotels might not have rooms. You don’t want to have to take a cab or bus to get to the convention every day. Believe me – even heading up to your room that’s in the same building as the convention is a lot of work! Once the tickets are booked then it’s time to research which publishers will be attending. You probably have already done this (as that was Step 17!) and was probably one of the reasons why you chose the convention you did. If you have more than one prototype that you’re bringing with you, then it’s a good idea to come up with a battle plan. Which publishers should you show your games to first? Don’t waste time pitching your games to publishers that don’t publish the kind of games you’ve made (unless you have heard that they’re looking to expand into different markets). For example – you wouldn’t pitch a party game to a company that only makes RPG (role playing games). I am a game designer who will also be attending the _____ convention and I am inquiring about setting up a meeting at the convention so that I can showcase a few designs that would be perfect for your company. I understand that you are looking for games that are quick to learn and have a lot of social interaction and I have a couple games that meet those requirements that I’d like to show you. 3) The next paragraph should be about your game(s). This is where your 30 second elevator pitch comes in handy. 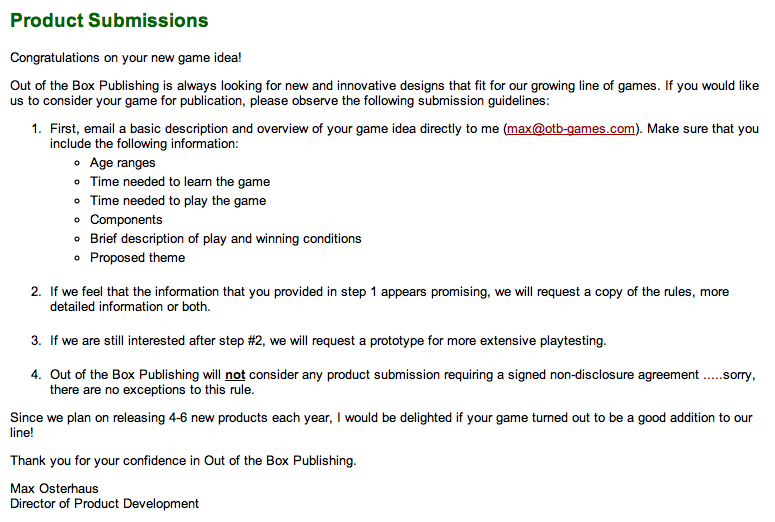 Write out a 1-2 sentence description of your game – and keep in mind the requirements of each publisher. You might have to tailor this part to each publisher since each publisher is looking for different things. If your game has something that a publisher is looking for – just make sure it’s highlighted here. 4) Finish up the email by reinforcing the purpose – setting up a meeting at convention. Ask for a specific date and time that would work best for you. If you have other arrangements or meetings (or seminars that you don’t want to miss) then you should list times that you are not available – because no one wants to be part of a huge back-and-forth email chain. You should send this email out around 2-3 weeks before a convention. If you don’t hear back in one week, then follow up with either a phone call or another email. 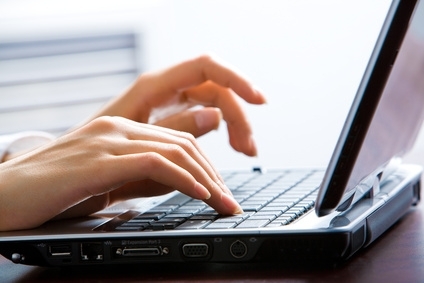 Obviously everyone is always busy, so remember to keep the tone of your email friendly! If these steps are followed then you should be in a great position once the convention starts! Next up: What to do at a Convention! As Jay is usually the one that is going to the convention as our “point man”, I do a lot of the intel in advance of the convention to try to plan out Jay’s trip and ensure that he is in the right place at the right time more often than not. 1) Go through any of the seminars / speeches that are given to earmark the ones we feel are worth-our-while, Not only are some of the subject vital if you wish to make a game that publishers will want to publish more than others (e.g. specific consideration on components, electronics in boardgaming, translation issues, etc. ), but some are given by the “superstars” of the biz – i.e. people you want to know that you know about them and what they believe in – if you get my meaning. Going up to Max Osterhaus of Out of the Box (of Apples to Apples fame) cold may be difficult. But if you have just listened to him talk about “Manufacturing Costs in the US”, you may be able to speak on a common subject – you’ve got an in. 2) Virtually “scout out” the venue if possible. A lot of conventions will provide floor plan online detailing which booths are where. This can help you make the most efficient use of your time and space. You can plan a route that takes you quickly from publisher to publisher. You can stack your prototypes in the order of your appointments so that you are ready quickly. 3) Check the schedule of events to know when and where to present your games in a favourable light. For example, if you have a dexterity game, there is a special time for that genre of games to be played at BGG.con. You will generate more interest in players that love that kind of game in that specific room and most of the publisher reps for that kind of game will be there if they are available. 4) Make a list of priorities before you book your ticket. What are you goals for the conference? What games do you want to get in front of a publisher? Which publisher, specifically? Make a list and check it twice because, as they say “Christmas only comes once a year” and unless you own your own Learjet, you may only get to one convention a year. So make your one trip count! Remember: Luck is nothing more than hard work coinciding with opportunity. Jay and I work hard (as can be attested to by my wife and my accountant) on creating games. But without getting them in front of a publisher, all that hard work will amount to nothing. Pre-planning the convention can make all the difference because you will have an efficient plan to execute. Two updates for you today. The first is about the contest I won with a friend of mine, Don, from Toy Vault’s PiecePack competition. We submitted the rules to a game we designed using a specific set of components that we called Cream of the Crop. The top 5 games were chosen to be included when the game was released – and our game was chosen as one of the five! We hadn’t heard from them all year – but today I got a response back from an email I sent that said that it had been back-burnered for awhile but is still in plans to hit the stores this coming year! They are targeting a second quarter release. Yay! The second update is that Gamewright has been reviewing the rules to our Jam Slam game (previously called Jungle Jam) and he expressed interest in playing a prototype of it after reading the rules. Now he did say he’s on the fence because he feels like Gamewright has a bunch of quick reaction games – in fact, when we pitched it we mentioned that this could be in the Slamwich family line – kind of like a spin off. But he wants to see a prototype to play it – so that’s always good news! We have had recent thoughts about changing the theme of Jam Slam to a witches cauldron – and we might do it and send both in, just in case he would prefer that it was NOT similar to Slamwich. So some great holiday news for us! Huzzah! Most Anticipated Games of 2011? Boardgamegeek.com is having a ‘competition’ to see which games are the 20 most anticipated games for 2011. Anyone can vote for the nominations up until Jan 5th. Then the top 50 nominations will be put to another vote to determine the top 20! Train of Thought – listed at #27. Belfort – listed at #59. Choosing which convention to attend: To most people reading this it probably comes as no surprise that there are indeed a lot of board game conventions in the world. If your main purpose for going to a convention is to pitch your games to publishers, then the thing you have to identify first is the purpose of each convention. Essen is the biggest board game convention in the world and its main purpose is to highlight the newest board games to the public. 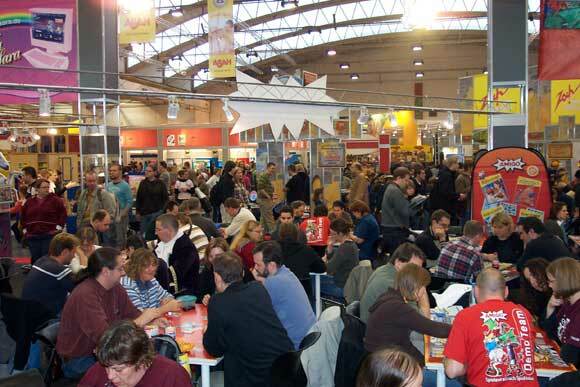 The focus at Essen is to experience a lot of new games – and buy a lot of new games! BGG.con is getting very large and its main purpose is to get together with old and new friends and play a lot of games – many of which are hot from Essen. This is a gamers’ convention. There are other activities and fun to be had – but all of them are focused around playing games. GAMA is meant for retailers and the publishers show up and demonstrate their products to all the retailers in hopes that retailers will carry more of their games. There’s not as much game playing at this one as there is at any other convention. 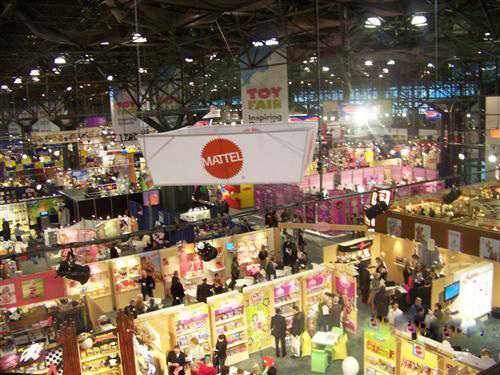 New York Toy Fair is a huge event but is focused more on toys, though board gaming is growing at this show. The purpose of this event is for publishers to show off their new toys in an effort to get them to the stores – kind of like GAMA – but for toys. Regional conventions happen all over the place and will be smaller than all these and could vary in size and scope and purpose. Mostly these regional conventions are meant for gamers to get together and play games – and possibly sample some new games from some publishers. So why is it good to know the purpose of a convention? Well you really need to get inside the head of what a publisher is trying to accomplish. At BGG.con the publisher is constantly trying to get their games played by people because every single person that attends BGG.con is like a walking advertisement. If someone at BGG.con likes a game and they chat about it on BGG.com – then that is worth more than spending a bunch on magazine ads and the like. Because publishers are so focused on getting their games played, none of the publishers have much time to talk to designers. Not only that, but BGG.con only has about 6-10 publishers show up anyway. On top of that, some publishers won’t even send the people that you’d want to speak to. At BGG.con, Jay Tummelson of Rip Grande didn’t come – instead he had a bunch of other people to explain games to people (and he sponsored the restaurant bus – yay!). So if you went up to someone at the Rio Grande booth – they wouldn’t be able to help you anyway. At Essen and the New York Toy Fair (though I haven’t been to either yet) publishers are focused on selling their game – which involves a ton of demoing. This again means they won’t have tons of time to talk to designers. The good news though is that there are a lot of publishers at Essen and the Toy Fair. I’d be curious to hear from any reader out there who’s been to Essen or the Toy Fair and what it is like from a designer’s perspective – please chime in! So that leaves GAMA. While the objective is similar – in that publishers are trying to sell their games – the attendance is mostly retailers, so it’s a lot less crowded. This was the first convention that I went to and it proved to be very effective. Since it wasn’t super busy, publishers were more agreeable to listen to designers. Almost all of the big and many of the small to medium publishers come to GAMA so you really have a great opportunity to talk to a lot of different publishers. GAMA is also great because they offer a lot of seminars and workshops and some are even targeted to the game designer. I’ve learned a lot from these seminars – and have passed off a lot of what I learned on this blog already! As for regional conventions, it’s rare that a publisher will show up. While they might sponsor a part of the event, they usually don’t send the people that you want to talk to. Often you’ll just get a card or direction to follow what it says on their website for submissions. That’s not bad as even getting a card is a tiny foot in the door, but I wouldn’t spend too much money in attending a regional convention if your main purpose is to get your games in front of publishers. Each convention has its benefits, but knowing the purpose of the convention will help you determine which one you should attend. I’ve now been to GAMA twice and BGG.con once. I’ve had to pay for my flights and hotels for each, so it’s definitely not cheap. As you’ll see in the upcoming posts, without attending these conventions Sen and I would not have had the success we’ve had (or at the very least it would have taken a lot longer!). Note that some are open to the public, some are industry and press only. There are also specific boardgame design related conferences, such as Protospiel in Ann Arbor, MI. If you check the site, you’ll see that Elfinwerks, Mayfair Games, Minion Games, North Star Games and Steve Jackson Games were present there. And you can be guaranteed they went looking for new material. Some smaller local conventions might have product reps that can meet with you – you just have to ask. When Jay and I both lived in Hamilton, we went BayCon – run by Bayshore Hobbies, our FLGS – and there were always reps from companies like Privateer Press, Mayfair, and Chessex demoing games, selling product and showing off unreleased titles. So check out what’s in your area before you drop a few c-notes to travel to NY, Chi-town or Vegas. Just got confirmation from Tasty Minstrel Games that they have decided to publish our third game, But Wait, There’s More! They also have a goal to ensure that the game is out in time for the holidays next year (lesson learned!!). This is fantastic news! With Train of Thought hitting in January, Belfort hitting mid-year (May?) and But Wait There’s More hitting the end of the year – we’ve now got three games coming out in one calendar year! To say we’re excited is a huge understatement.